Developments of eSystems Engineering (DeSE) has been established in recognition of the escalating importance and relevance of electronic media, applications and devices in our everyday work, home and commercial environments. These systems have often arisen as solutions to domain specific problems, addressing areas of social science, business studies, engineering, auto, health studies, computer science, communications, geo-systems and most other academic and vocational subject areas. Accordingly developments and innovations in e-systems engineering have appeared through sources appropriate to their subject area with little heed paid to the actual underlying science of engineering an e-system. Therefore, it is the intention of DeSE to provide the increasingly essential forum dedicated to discussing and reporting on developments in the field of e-systems engineering; including all relevant research and practical advancements. In education there is vast scope for the introduction of advanced eLearning tools allowing students/pupils an improved level of independent learning. E-systems are often based on or are required to exhibit some form of Artificial Intelligence (AI). AI techniques based on paradigms such as neural nets or expert systems will thus be relevant to and impact upon research into e-systems development. In eBusiness there is already a significant uptake of eSystems by eCommerce websites, which can only increase in future years with developments in ePayment systems and newly developed models of commerce. Issues of trust, security and database design are typically studied within this area. eServices are becoming an important part of Web based computing with Service Oriented Architectures (SOA) and Software as a Service (SaS) seen as the future of computing. We are proud to announce that the Applied Computing in Medicine and Health, 1st Edition is available to pre-order via the Elsevier Store from the link below. The authors of the book chapters are international researchers based in the UK and abroad from both academia and practitioners from medical institutions. 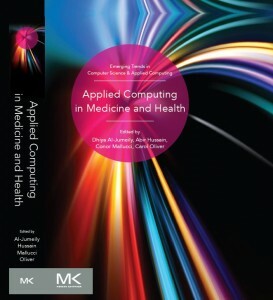 The book can be used as teaching materials for undergraduate and postgraduate degree students, for students studying for a Computer Science Degree, Software Engineering and Health Informatics related subjects. Additionally, researchers can use the book as reference for their research and development in the field of AI and Health.